Marabou attended a workshop at the National Museum of the American Indian in New York that was offered in conjunction with the exhibition “Taíno: Herencia e identidad indígena en el Caribe | Native Heritage and Identity in the Caribbean.” The workshop was offered right around Indigenous Peoples’ Day and provided educators with ways to honestly teach the history of Christopher Columbus and Spanish contact in the Caribbean. One of the speakers was Lynne Guitar, PhD, an American scholar and former faculty at Vanderbilt University. For 18 years she lived and researched in the Dominican Republic, publishing a number of articles about Taíno culture. Although she still writes academically, an “About the Author” section in one of Lynne’s books says, “her desire has always been to write historical fiction–she says you can reach far more people with historical fiction than with historical essays.” Marabou shares with you Lynne’s book No More Grating Yuka | No Más Voy a Guayar Yuka, a bilingual (in English and Spanish) children’s book that is one of a series set in what is now the Dominican Republic during the period leading up to and including Spanish contact in 1492. Lynne’s books, the Taíno Ni Rahú Series | Serie Taíno Ni Rahú, center around the experiences of two Taíno siblings, Anani and Kayabó. For educators and parents, these books offer a great counterpoint to Columbus “discovery” myths that may still be perpetuated in the classroom and in popular media. Lynne’s characters share their everyday lives and concerns, allowing readers young and old to better understand aspects of Taíno culture. By telling the stories through the eyes of Anani and Kayabó, children can relate. More importantly, children will learn that Columbus did not just land in the Caribbean and encounter “indians,” but instead encounter people, families, and a long established culture. By providing this humanizing element to the Columbus contact story, children will better understand how Columbus’ and Spain’s (as well as other colonizing forces’) actions meant that people, families, and cultures would would be treated poorly, experience violence, and told that their culture was wrong. Split screen showing the intro pages to both the English and Spanish versions of the story. In addition to sharing Taíno culture with children, Lynne’s books are great teaching tools for both adults and kids. Lynne provides specific cultural context for her stories, explaining where the locations are in the present-day Dominican Republic. Marabou finds this important because children’s works that attempt representation of marginalized cultures often don’t place the people and stories in concrete locations, unintentionally perpetuating the idea of these cultures as fantasy. (Moana, for example, does this. Marabou loves Moana, but where exactly does Moana live in the vast Pacific?) Lynne also provides the entirety of her books – from dedication page to “about the author “- in both English and Spanish. They serve as language workbooks as well as storybooks. Reflecting her academic side, Lynne makes some linguistic notes which mention the work done to reconstruct the Taíno language. This explains why she uses a “k” in instances that a hard sound is more accurate to Taíno pronunciation in contrast to the softer “c” seen in Spanish usage. There is a “Glossary & Pronunciation Guide for English Speakers” of Taíno words and for Spanish speakers, a “Glossario de palabras taínas” (Glossary of Taíno Words). The glossary provides the English or Spanish equivalent of a Taíno word as well as explaining it in the context of Taíno culture. The Taíno Ni Rahú Series | Serie Taíno Ni Rahú remains relevant as the reader gets older. For very young children, the books are stories filled with adventure. For English or Spanish language learners of all ages, the series helps develop reading comprehension, practice language skills and vocabulary. For all readers, Lynne’s books provide a glimpse into the experiences of the Taíno people whose perspectives and stories have willingly been left out of mainstream accounts of history in the Americas. 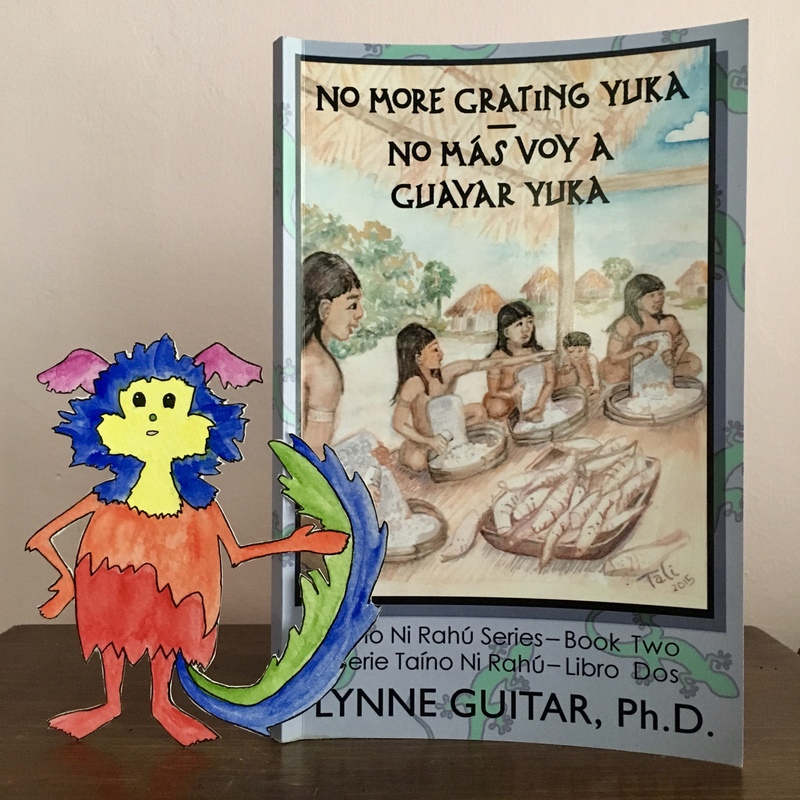 Marabou doesn’t want to direct sales to Amazon, (although Lynne’s book is available there) so here is a Barnes and Noble link to Lynne’s No More Grating Yuka | No Más Voy a Guayar Yuka if you’re interested in purchasing.